Best view of the day before the clouds moved in. 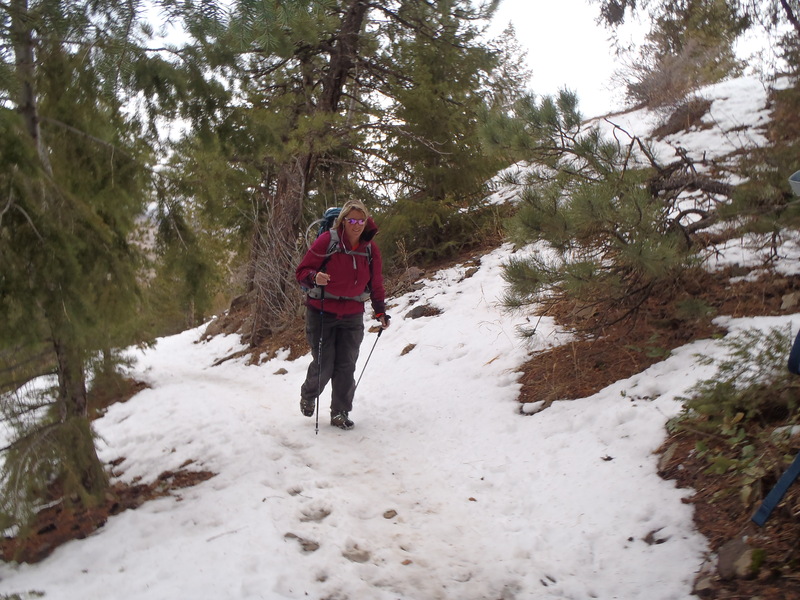 Degree of difficulty: Moderate, it is steep in some parts but I am not sure I would say it is difficult. 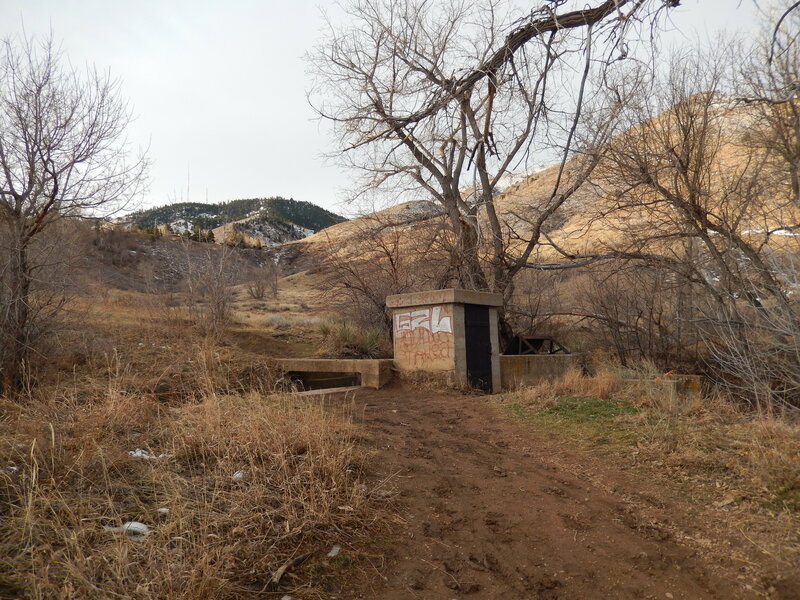 Bathrooms: Not at the entrance off of 6th Avenue but there is one at the Windy Saddle parking lot and at the Lookout Mountain Nature Center. I have driven past this hike a million times and I am always wondering 2 things. First, what a weird place to pick up a trail and second, dang that is crowded! It has seemed crowded regardless of conditions too! 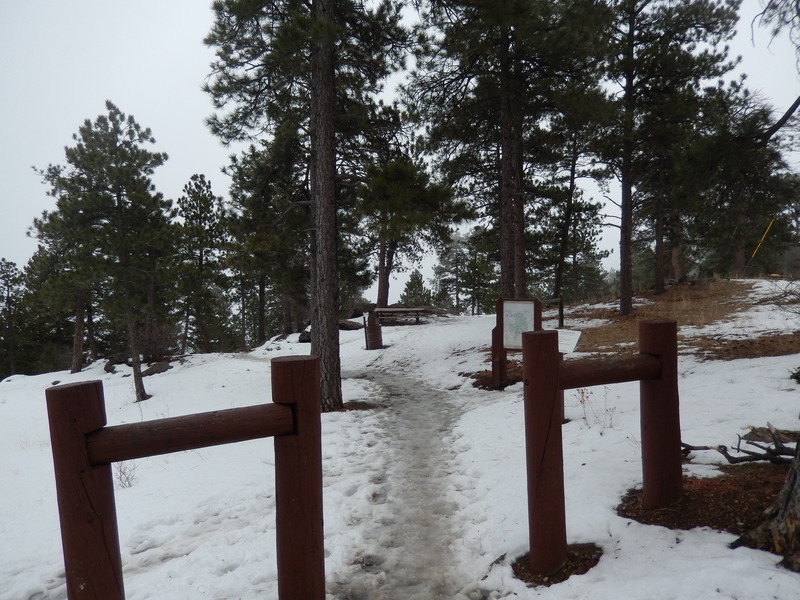 This past Saturday, I had hoped beyond hope that we would have our new snowshoes but we didn’t so I decided it was time to check this particular trail out. I am not sure why I have been avoiding this one for the past 2 years, but strangely I have manged to completely block it out of my mind. It is a shame too because after the first mile and a half it is beautiful. 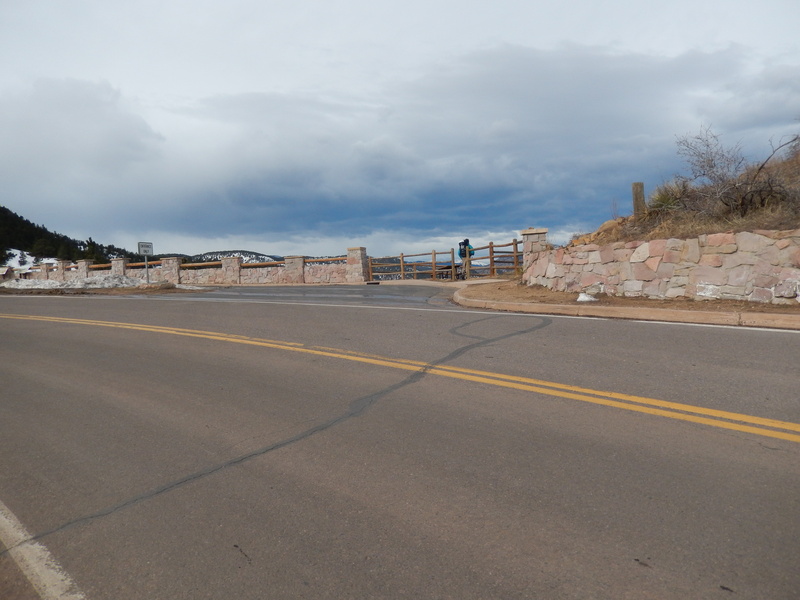 You start out literally on the side of 6th Avenue in Golden… And I mean on the side of the road. 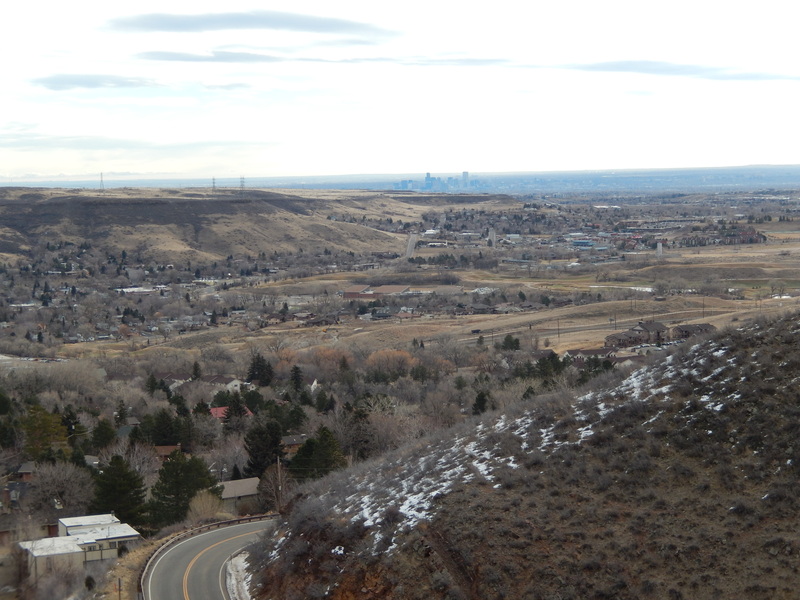 If I hadn’t passed it a million times I would never know the Chimney Gulch trail head was here. The first mile just starts climbing up along the road and the neighborhood. 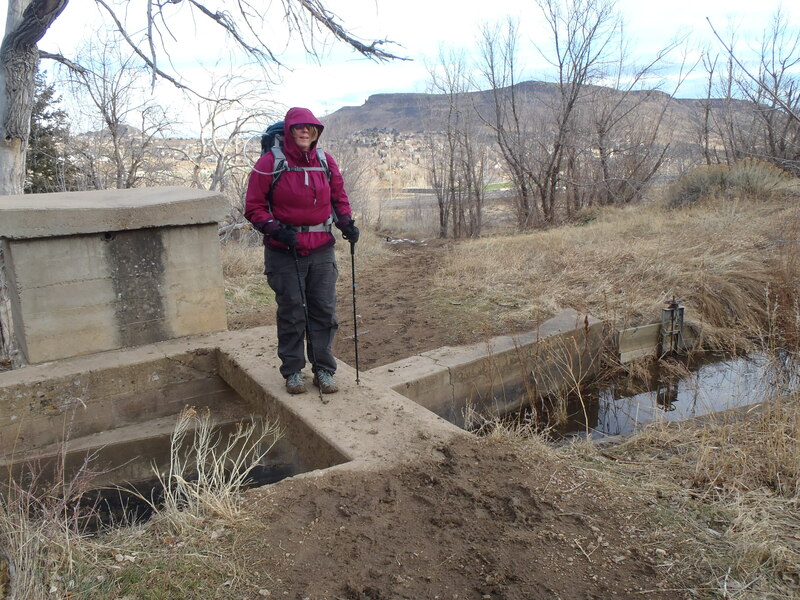 Before it gets steep, we came to this cement something or other that acted as a bridge over a little creek or drainage crossing. 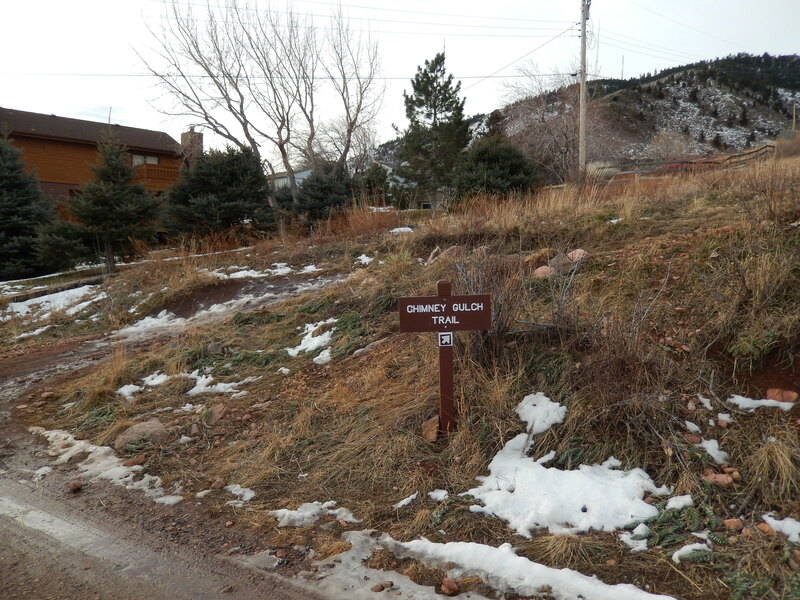 I only mention it because there is also a path you can take over to your left which seems more likely but it is the neighborhood access trail, not the Chimney Gulch Trail. So climb that cement thing and cross over, continuing up. 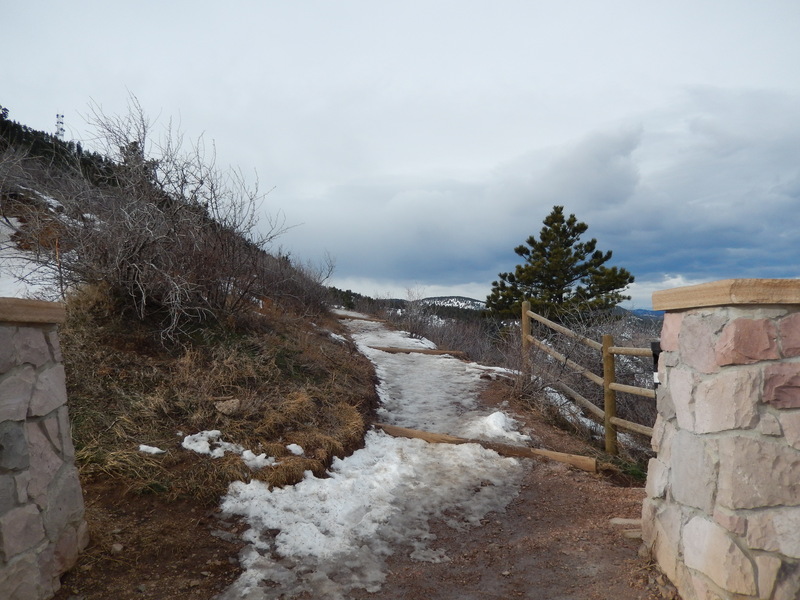 On Saturday the trail was super muddy all through this section, with the wind blowing good and strong but strangely warm, we were sliding all over the place! 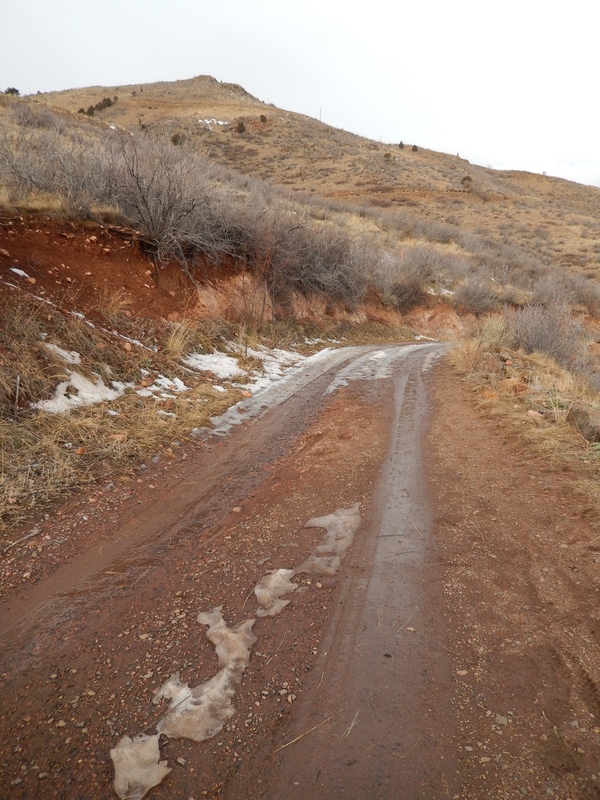 After the first mile you come up to a dirt road/driveway… more likely driveway, go left and look on your right and you will see the continuation of the trail. Me at the Driveway break with the sign Aaron made for my backpack advertising my blog…isn’t he sweet!?! 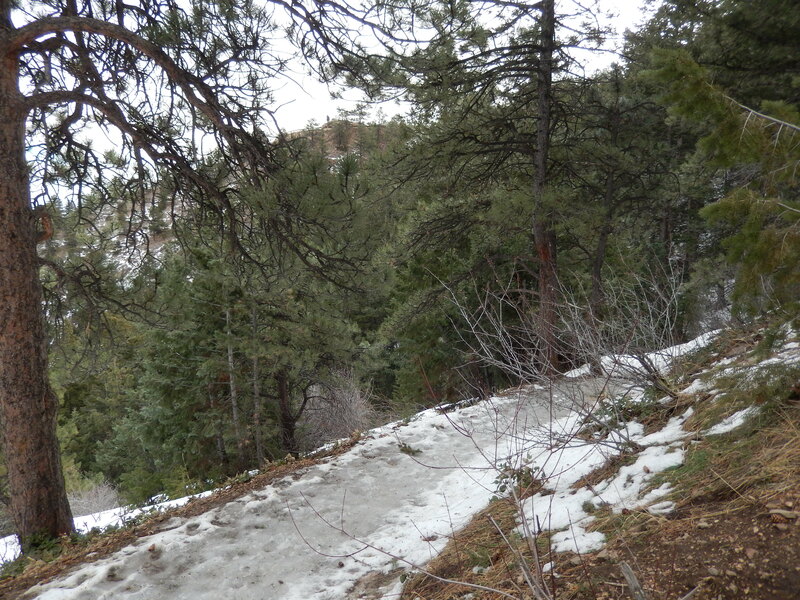 This next section of the trail goes for 1.5 miles and crosses over a true paved road 2 times. 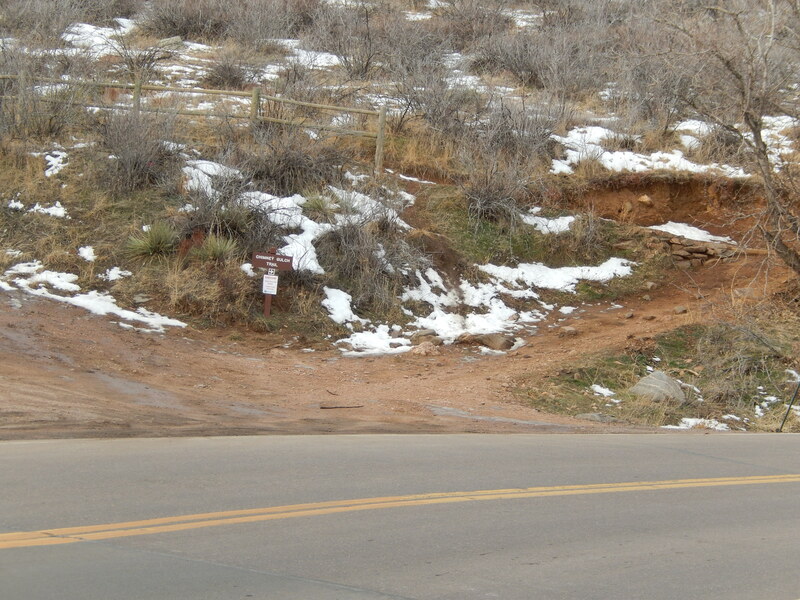 This is a windy mountain road that I assume ultimately goes to the top of lookout mountain too, but you have to watch out for both cars and bikers. It was pretty slick from snow/ice, we did have to put on traction devices to help us walk through it safely about a half a mile in. We must have hit at the right time or the wind and clouds kept everyone at bay, because we had most of the way up to ourselves. 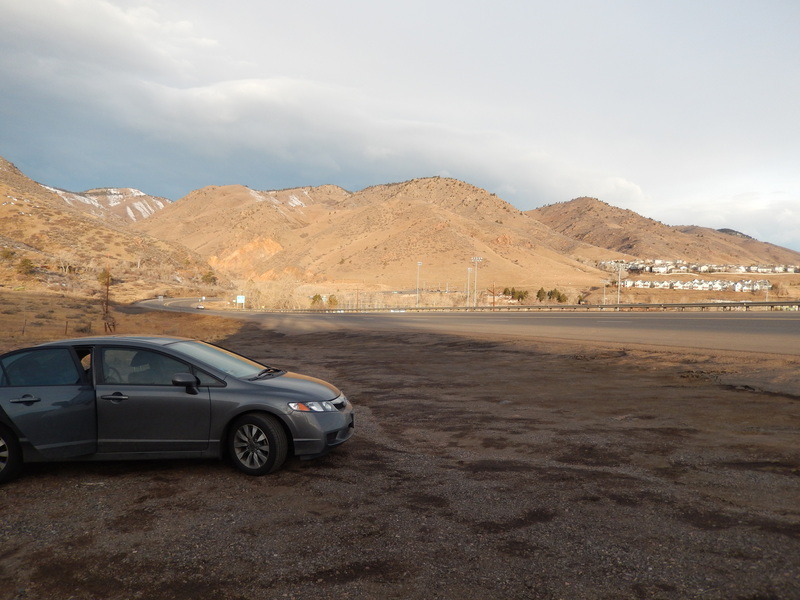 At the second Road crossing you come to this very picturesque parking lot with a great view of mountains and beautiful stonework. 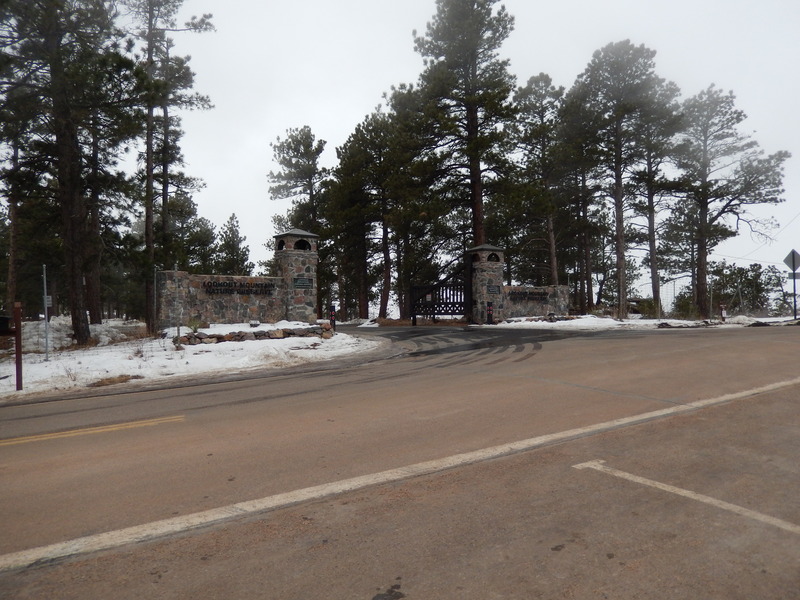 This is the Windy Saddle Trailhead and parking lot where the one port-o-potty is. 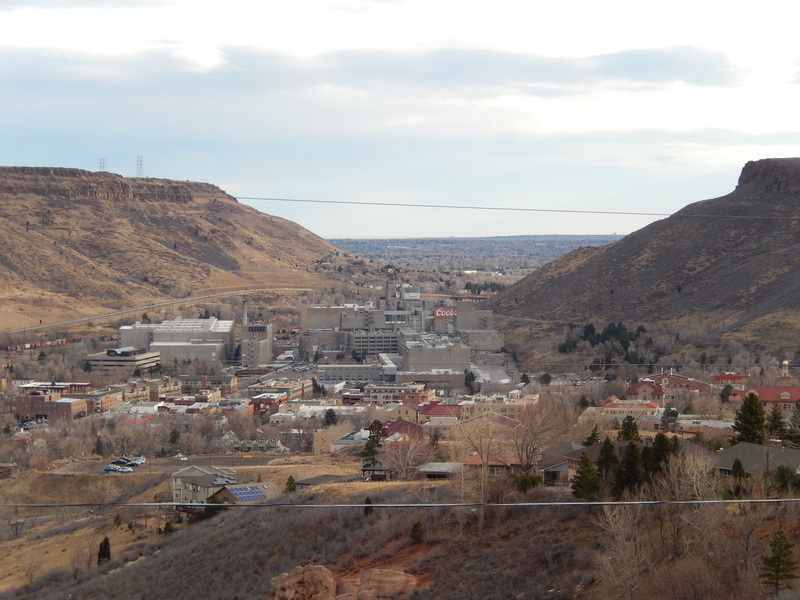 From here it is just over a mile to the Lookout Mountain Nature Center and top of the mountain. 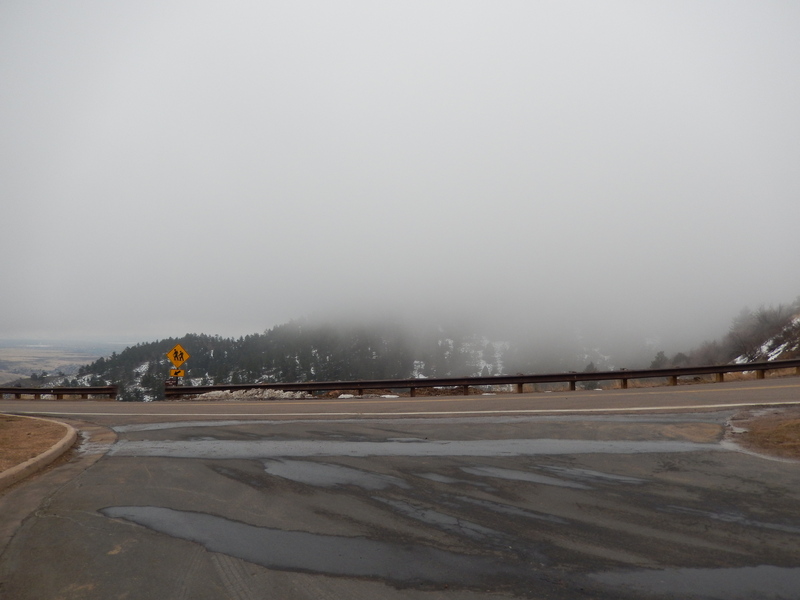 I am not sure exactly when it moved in, but about half way up this final climb, clouds encompassed the top of the mountain and all views evaporated. Don’t get me wrong, the cloud and fog brought its own beauty to the hike, but I have no good summit shots for you. 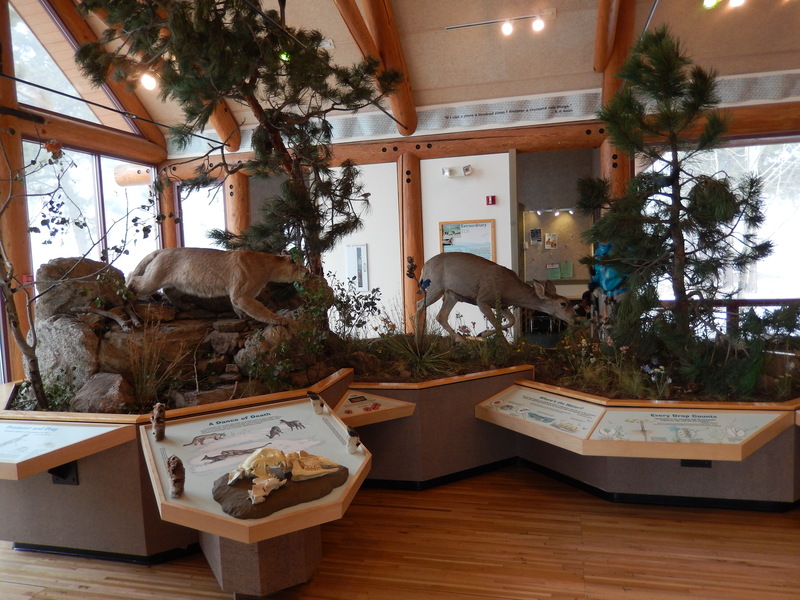 Instead of ohhing and ahhing at Golden down below, we hit the Nature Center talked to the people running it that and found out that Boettcher Mansion was open to the public right that minute for wedding reception tours. I didn’t want to miss an opportunity to check that out so we walked through there too. 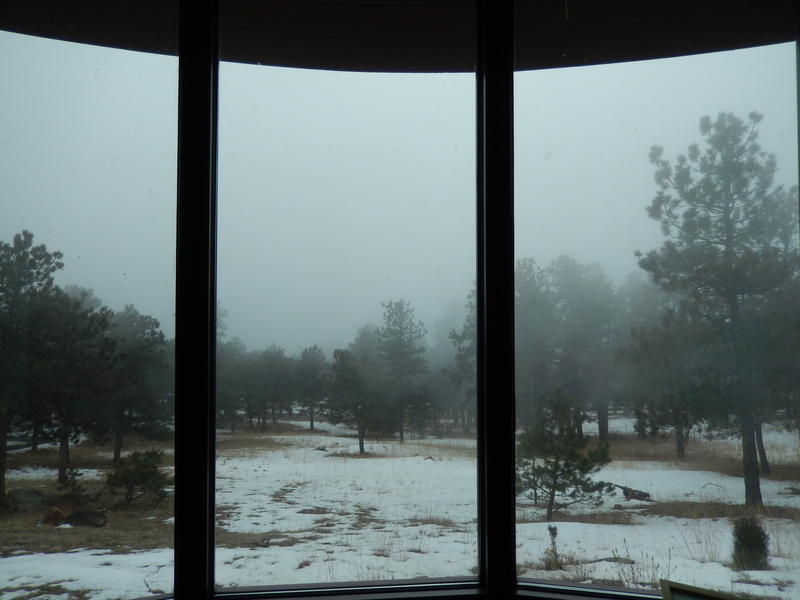 I am sure the views are spectacular here but the clouds just got thicker. 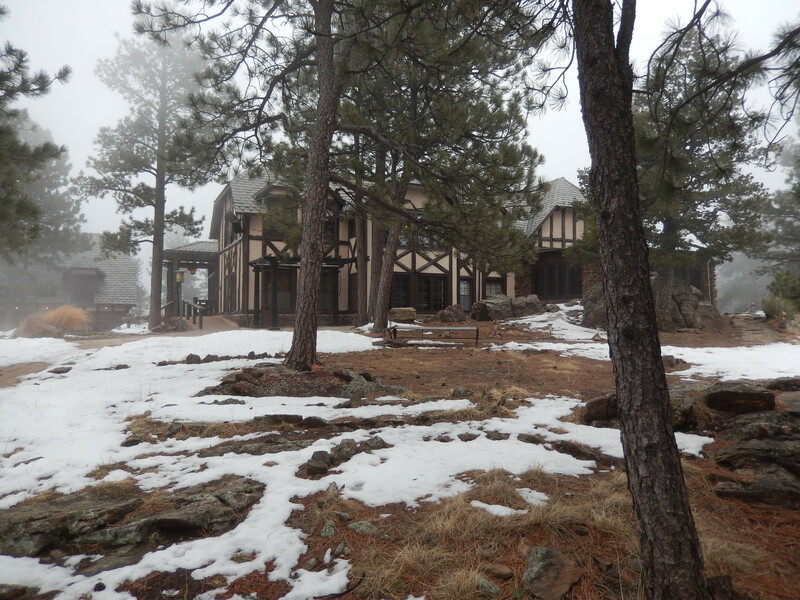 The house was hauntingly beautiful in all the fog. We made a super quick descent because it was cold up in the clouds! 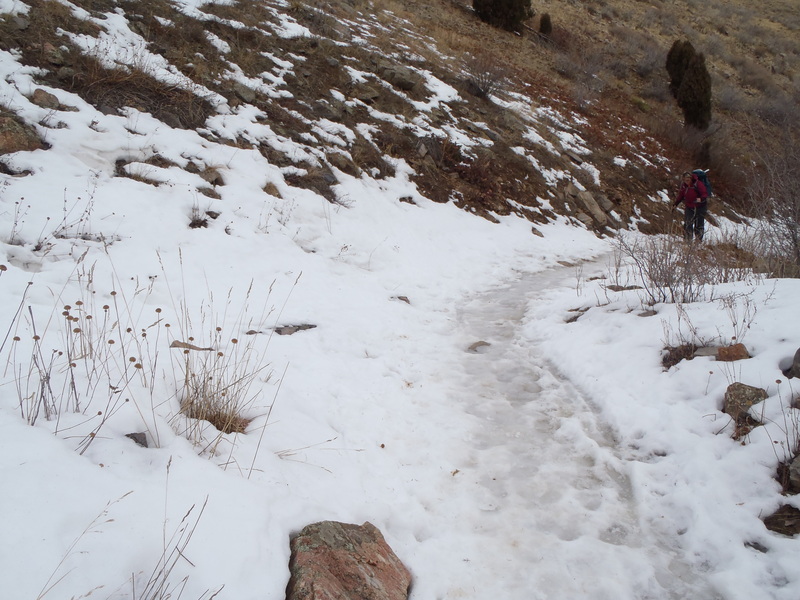 There were way more people out on the trail now and much of the ice that caused problems on the middle 1.5 miles was melting at a good pace. 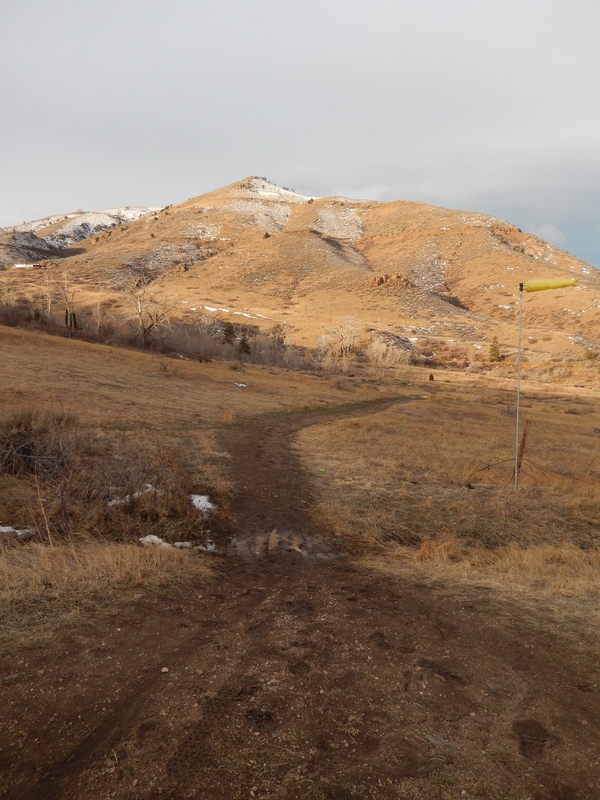 I will tell you I am not very fond of the first mile of this hike, it is kind of boring and your views are of houses with some of Golden spread out below you. But once we got to that second part, the surroundings totally changed and it was all trees, mountains and terrain which was all lovely. 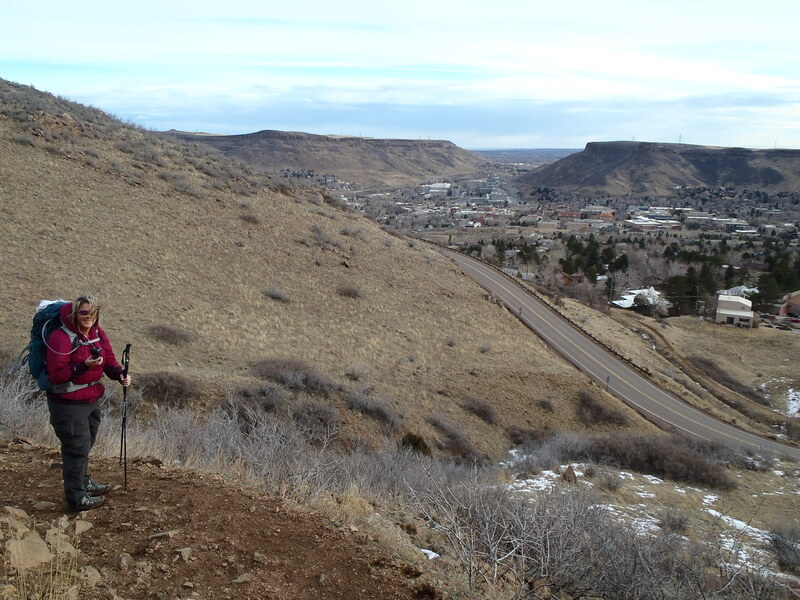 I think if we do this one again, I would start at the first road crossing on the second section of Chimney Gulch. I am not sure how to get to that road but I think it is the light just south of the turn off for the first section. 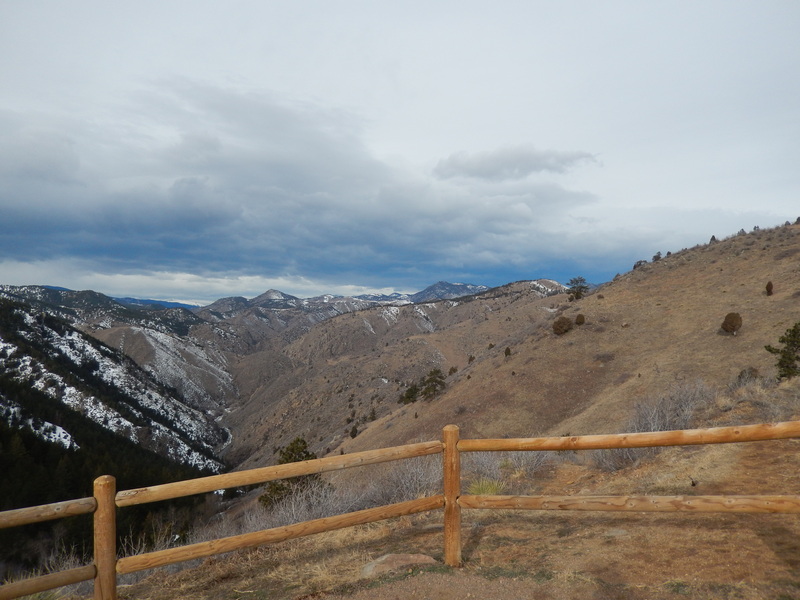 If you find yourself in Golden CO and need a good diversion, check this hike out, I think you will like it. 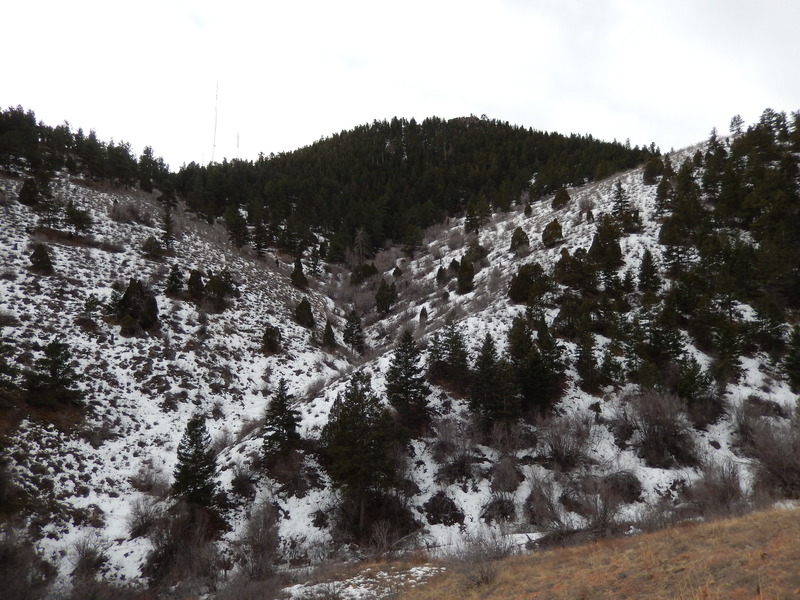 My Favorite Pictures from the hike will be after the directions. Directions: Take 6th Ave West from Denver to Golden for about 12 miles. About ¼ mile before the 6th Ave/Route 58/Route 93 intersection there will be an unmarked pullout on the left side of the road. Park here. 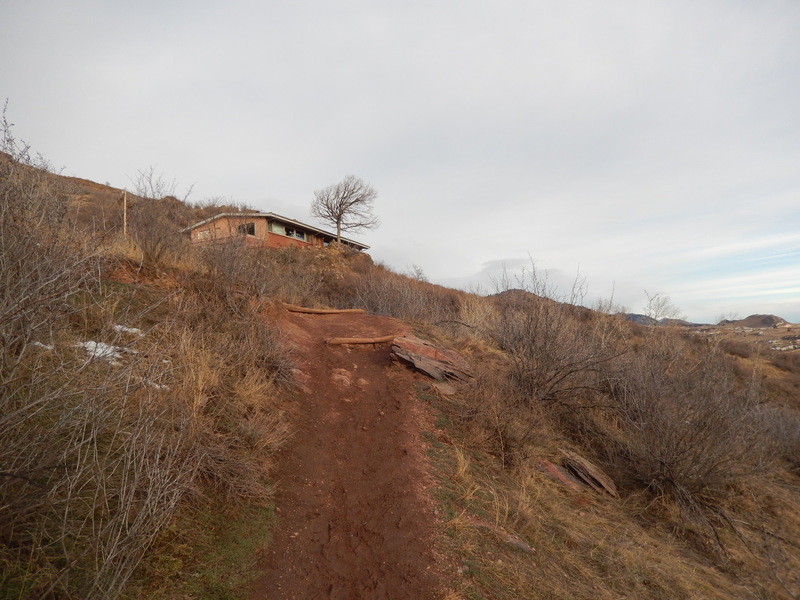 You will see some single track leading up the mountain. Take this. Hey there! Fun hike! You’re right about the road. 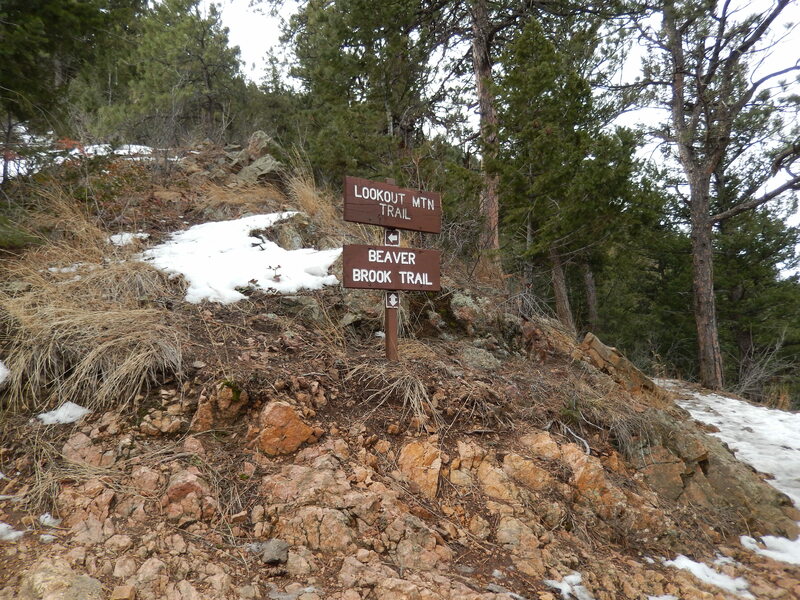 Lookout Mountain Rd is the first one south of Clear Creek Canyon which is Highway six. Go uphill at that light. Pass through the stone pillars. It will take you all the way up if you like. Thanks for posting this hike! Ohhh thank you Heather! It is good to know maybe cutting of that first mile is easy! Thanks for reading! 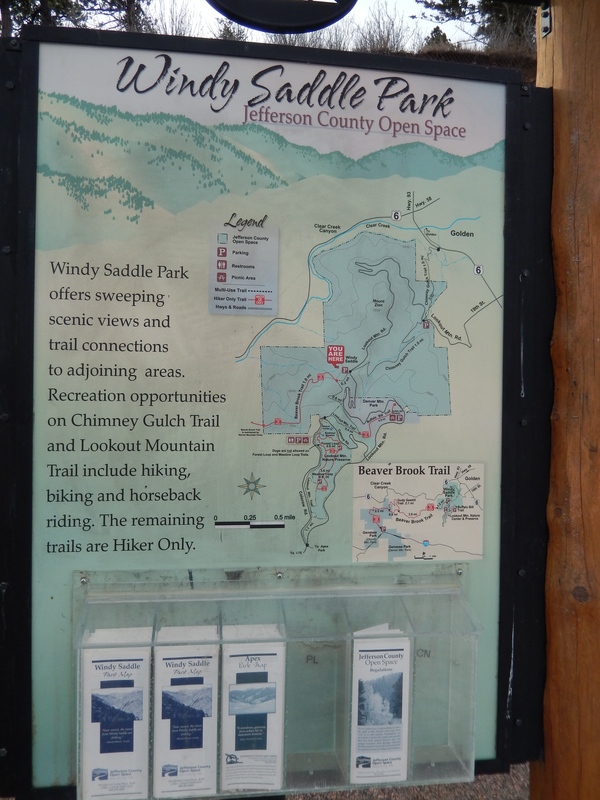 Thanks for posting about these trails. 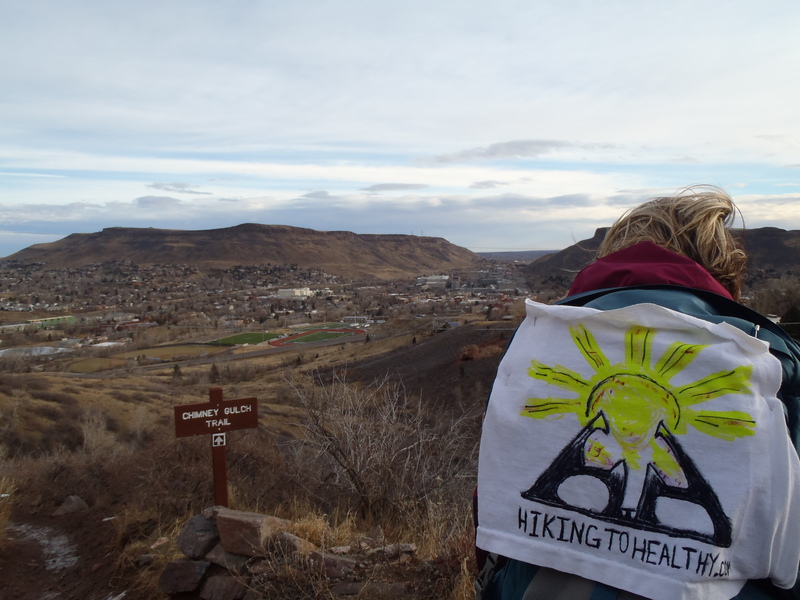 This hike will be a great training opportunity to prepare for our March crossing of the Pyrenees while on the Camino de Santiago. 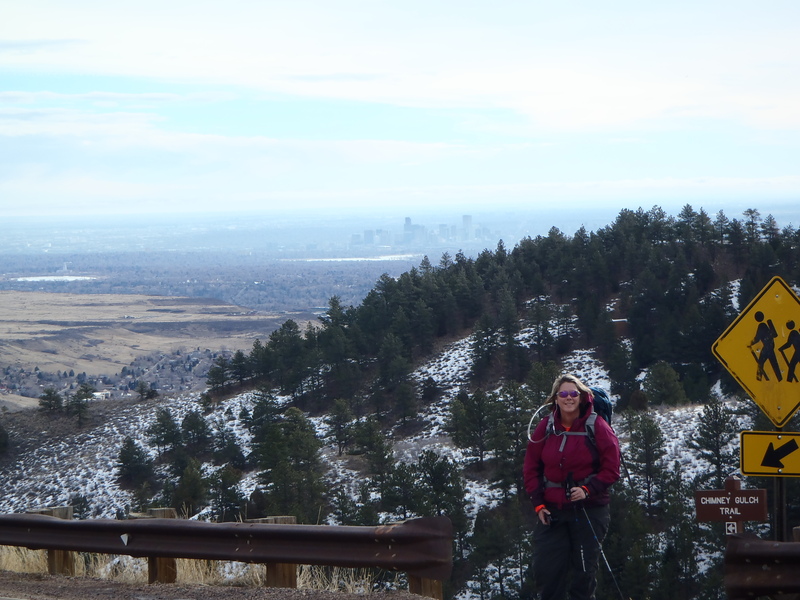 We will likely hike it this week as our last hike in the states before we depart. Keep up the great work! Oh my gosh, you must be so excited that it is finally here!!! I cannot wait to read about your journey!!! 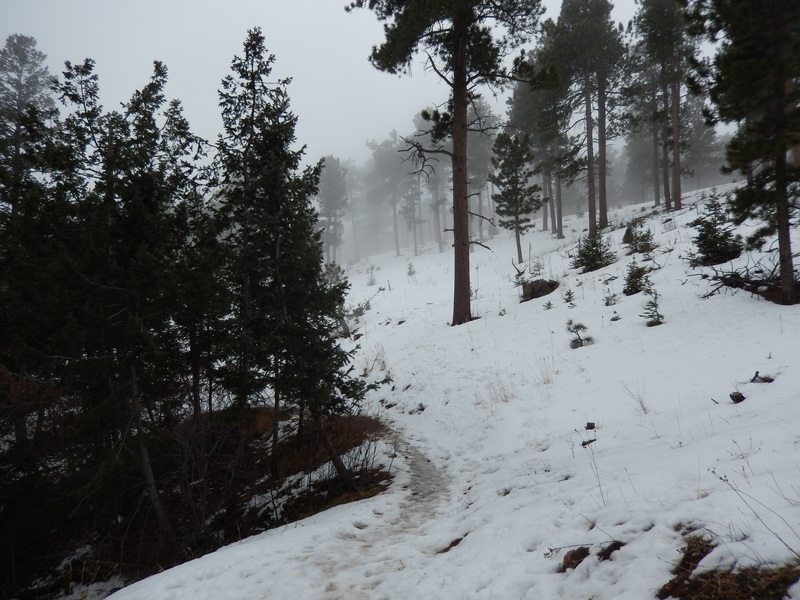 I hope you like this trail, bring traction devices, the backside is in the shade and probably has some nice icy spots hanging on. Thank you!!! Thanks! He was so cute coming up with them… he did one for his backpack too. Wow! Thank you so much Andrew, that means a lot from you when I know what an amazing person you are! Please let me know when you are here, I would love to show you our state!!!! Travel Safe!!! Love the sign. What a neat idea. I bet it also helps motivate you. Going to have to get my wife to make me one. I have no artist talent in that regard. Thank you! He was so cute putting it together for me, I love it!!!! Like you, I have no artistic talent in that area so I am very lucky to have him taking care of me!